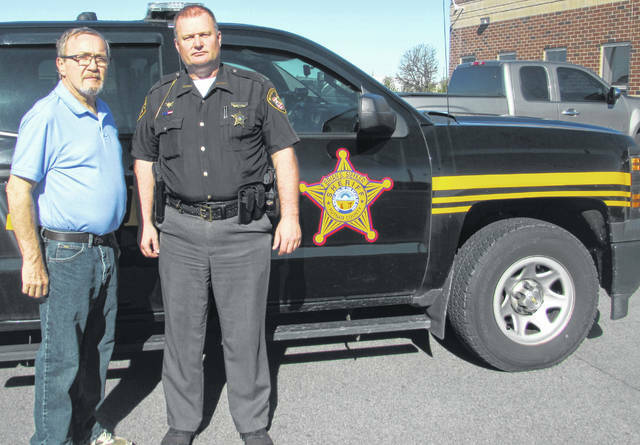 Pictured from left are Marvin Schwiebert, who has retired from law enforcement after 44 years, and Putnam County Sheriff Brian Siefker. OTTAWA — Marvin Schwiebert knew he wanted to work in law enforcement when he was 16 years old. He retired at age 65 from the Putnam County Sheriff’s Office as a detective April 5 after serving 44 years in law enforcement. His declining health made him decide to retire, and a party was held at the sheriff’s office that was attended by county officials on April 4 to honor Schwiebert. “When I was 16 I did a lot of ride alongs in Henry County, where I lived, with friends who were on the sheriff’s office and from there got into law enforcement,” Schwiebert said. He attended Four County Vocational School graduating in 1978 with law enforcement training and then began work as a patrolman at Henry County Sheriff’s Office. He did traffic control, investigations and handled complaints as part of his duties. He was employed there for over 16 years and then began work in 1991 at Putnam County Sheriff’s Office. He served as chief deputy under former Putnam County Sheriff Ron Diemer and has served under a total of nine sheriffs in Henry and Putnam counties over the years. Over the years, he said it is sad to see people who don’t respect law enforcement and the technology criminals use to commit crimes. One of his favorite things to do was to teach students about farm, water, gun and bicycle safety, a role he filled for 15 years. Putnam County Sheriff Brian Siefker said Schwiebert has taught the office a lot with his experience and handled violent and non-violent cases. “He will be greatly missed, and we appreciate all the years he has spent here,” Siefker said. He said Schwiebert was dedicated to his job, hardly ever missed a day of work and was always reliable and dependable. Schwiebert received an award from the Secret Service for assisting solve a check fraud case. He also helped solve a bank robbery in Leipsic. “It takes dedication to be a detective. It’s not just one person and takes everybody to give input because if one person works on the case there is too much tunnel vision and you have to look at all of the options,” Schwiebert said. He has found it fascinating to learn how criminals think and what they do. Schwiebert has plans to spend time with his family and ride his motorcycle in his retirement years.